Typically, I’m against actively praising or condemning a movie without seeing it. There are plenty of movies that have looked terrible yet been surprisingly good, and plenty of “sure things” that ended up disappointing. It’s fine to decide you don’t want to see a movie based on marketing/word-of-mouth/whatever, and it’s great to have loyalty to a filmmaker (even a franchise, though that’s more iffy), but when you start spouting off impassioned opinions about a film you haven’t seen, you just look foolish. With that in mind, I am very conscious of the fact that my vocal disdain towards Planes – a film that is roughly a month away from being released – is entirely hypocritical. I think it looks terrible, and based on the general reaction from the citizens of the internet, you probably do too. However, I’m not going to defend my hypocrisy, instead, I just wanted to talk about a few things that have me truly baffled about this movie on a level that is more-or-less separate from how good or bad it actually ends up being. Planes is not a Pixar film. You’d be forgiven for not knowing this because you would be far from alone. This is a movie that is connected to a Pixar property, to a casual observer looks like a Pixar movie, and is even being advertised in a similar manner to the way Pixar movies are advertised (“From above the world of Cars” as opposed to “From the makers of Cars”). However, this film is, in fact, being made by DisneyToon Studios – the branch of Disney Animation that is dedicated to cheap direct-to-video knock-offs of Walt Disney Animation Studio’s features. These are the people behind such enduring classics as Pocahontas II: Journey to a New World, Stitch! The Movie, Atlantis: Milo’s Return, and Cinderella III: A Twist in Time. I find it extremely surprising that Pixar would be willing to chip away at their brand identity by allowing another studio, one known for poor quality knock-offs, to make a movie that on a surface level appears to be a Pixar movie. Sure, it’s not like the Cars franchise is some great cinematic achievement that will be sullied by this film, but this is a movie that will reflect on Pixar’s image despite the fact that they had nothing to do with its production. Walt Disney Animation Studios already had their reputation tarnished by DisneyToon (and continue to do so by packaging these sequels nobody wants with the original films’ Blu-ray releases), why do the same to Pixar? I don’t understand why John Lasseter, who overseas all production across Disney’s animation division, would allow another studio to make a movie that impacts the image of the studio that he helped to create. I understand that Lasseter dearly loves the Cars series, but is he really so blinded by that love he can’t see what an obviously terrible idea this is? If a Cars spin-off needed to be made, at the very least it should have gone to Pixar Canada who have already proven themselves on the excellent Toy Story Toons as well as the Cars Toons which aren’t that bad all things considered. That, at least, would have kept it “within the family,” so to speak. Once again I think back to Circle 7 and wonder how is this any different? I’d be remiss if I didn’t point out that this isn’t the first time, DisneyToon has borrowed characters from the folks up in Emeryville. 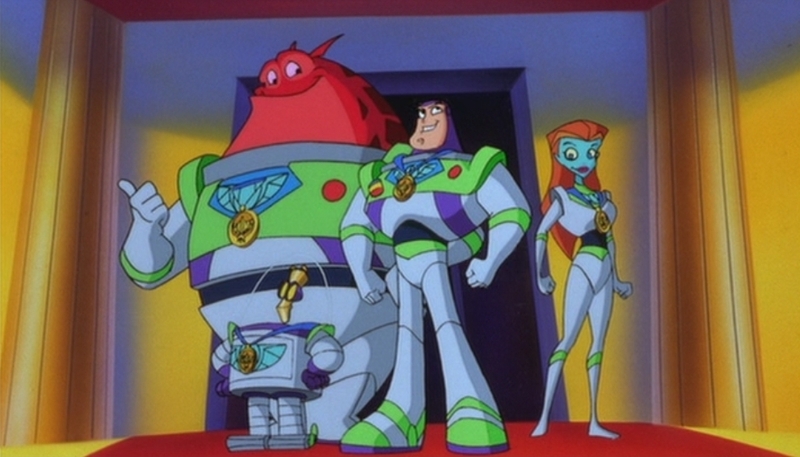 The 2000 direct-to-video movie Buzz Lightyear of Star Command: The Adventure Begins was also a DisneyToon production. The big difference here, though, is that it was inherently obvious that the movie was not a Pixar movie. In 2000, people still firmly associated all full-CG movies with Pixar, and so a hand animated film, even one starring Buzz Lightyear, would be an instant signal to people that this is different. There’s no such signal with Planes, in fact, it seems fairly deliberate how much they want this to look like a Pixar movie. I can’t tell, is this a Pixar movie? True to form for DisneyToon Studios, Planes was intended to be a direct-to-video release, but Disney shifted gears and added it to their summer line up of theatrical releases. Yet the film still looks noticeably cheap. Its animation and visual polish aren’t up to par with a major theatrical release and it stars Dane freaking Cook for Pete’s sake. “Because, money” is the most obvious justification, but I don’t really think that’s Disney’s play here. The Cars movies have never been massive box office hits, and I’ll be surprised if Planes grosses half as much as Cars 2 did. The series has thrived on merchandise sales, not box office sales, so why go through the trouble releasing it in theaters? The direct-to-video market has traditionally been lucrative – thus why DisneyToon released so damn many of those awful sequels – so why not go that route here? It seems like a lot of effort for something that will probably be less effective then simply setting up a display next to the check out line in Walmart. Disney is going nuts over this movie right now! It’s a direct-to-video movie that got promoted to a theatrical run, and they act like it’s the biggest thing they have in their stable. This is intended to be the first part a trilogy, there’s whispers and murmurings of theme park tie-ins (please god, no), and it’s a serious contender for their most heavily marketed film of 2013 (Monsters University might edge it out, but only barely). I mean sure, the Cars toys make a lot of money, but it’s still to be seen whether Planes will manage the same feat. Why is everyone at Disney losing their proverbial minds over it? It seems like an attempt at hype by force, and does that ever really work? I suppose it’s possible that they’re excited because the movie’s actually really good, that despite all indicators to the contrary DisneyToon may have made a movie worth seeing… Aw, who am I kidding? This movie is going to be trash.